Definition: Dysarthria is a motor speech disorder that is a condition when the muscles that a person uses for speaking weaken or it becomes difficult to control those muscles. Dysarthria often is characterized by slurred or slow speech that can be difficult to understand. The term is from New Latin, dys- “dysfunctional, impaired” and arthr- “joint, vocal articulation”. Any of the speech subsystems (respiration, phonation, resonance, prosody, and articulation) can be affected, leading to impairments in intelligibility, audibility, naturalness, and efficiency of vocal communication. Dysarthria that has progressed to a total loss of speech is referred to as anarthria. Dysarthria is a commonly occurring speech problem that appears due to different types of neurological disorders from any form of injury to the nervous system or as a side-effect of certain medications. 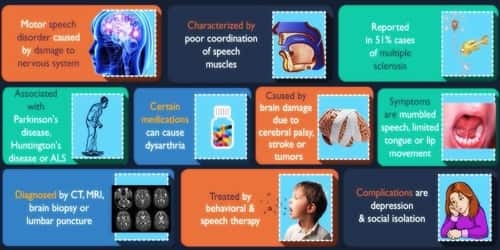 Such neurological disorders cause partial or complete facial paralysis leading to weak muscular movements in the throat or poor movement of the tongue. Spastic Dysarthria: It is a type of dysarthria that is caused by the injuries to both the sides of an upper motor neuron. Flaccid Dysarthria: It is caused by the injuries to one or both sides of a lower motor neuron. Hyperkinetic Dysarthria: It occurs when some parts of basal ganglia are affected, mostly due to the formation of lesions. Ataxic Dysarthria: It is a type of dysarthria that occurs due to injury to the superior cerebellum and superior cerebellum peduncle. Unilateral Upper Motor Dysarthria: It occurs when one edge of the upper motor neuron suffers injury. Hypokinetic Dysarthria: Like hyperkinetic dysarthria, this type of dysarthria occurs when some parts of basal ganglia are affected. 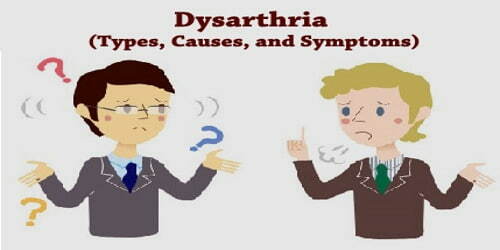 Mixed Dysarthria: It occurs when one or more of the above-mentioned dysarthria affect a person. Some medications, such as narcotics or sedatives, also can cause dysarthria. Dysarthria is commonly reflected in multiple motor-speech systems; however, in many patients, a single motor-speech system may be affected. The severity of the disease ranges from infrequent speech difficulties to speech that is completely garbled.